Daily View from Chengdu: Riding accessories! In order to ride a bike in Chengdu, one must really look the part first. Riding a bike comes with so many accessories! Yes, the lock, the helmet, the reflectors, whatever; but the best part here is that you get to wear puffy gauntlets and masks as you ride around town. So of course, after I bought my new bike this Sunday, I went straight to Auchan to pick out my own fancy gloves and dainty caplet. I think the main purpose here is so you don't get your nice clothes dirty or maybe protect yourself from the pollution/splashes. I didn't get the mask after all because I couldn't wear it with my helmet, only the bright orange sleeves. 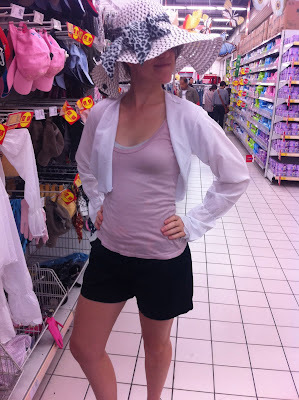 Jessica also picked out a nice riding hat and caplet. We couldn't understand why all the caplets were white? Won't they just get dirty? I'm looking for a mud-colored one for myself. Also, I rode my bike home from the shop and didn't break my arm. Success!